The long-awaited James Wallis art-as-RPG, Alas Vegas, is finally available for purchase, and it’s led me to launch It’s In the Cards Week – a week dedicated to games that eschew dice in favor of cards for gameplay and task resolution. This game was Kickstarted five years ago, and various elements in play pushed its final delivery out quite a ways. However, the wait is more than worthwhile as “the Godfather of Indie Games” (as anointed by Robin Laws), along with a truly all-star cast, brings us one of the most innovative immersive story ideas with a gameplay style that will throw you for a loop while it drags you into a story you help unveil as the clock keeps ticking. You wake in a shallow grave in the desert. It’s night. You have no memory of how you got here, or who you are, or the location of your clothes. A scar of neon in the shape of a city squats on the horizon. There are answers there. And trouble. 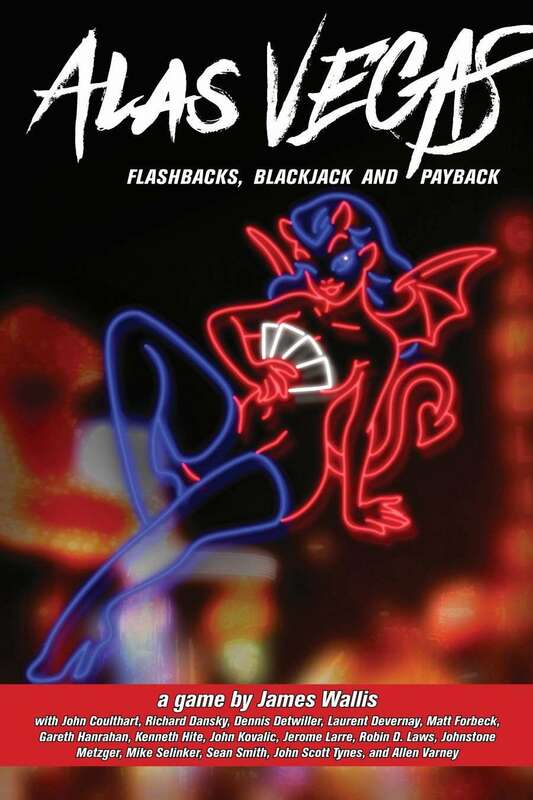 ALAS VEGAS is a dark journey through a bizarre and terrifying casino city where everything has a cost. Caught in a war between the Rat Packers who run the place, the players must find allies, the truth, and a way to escape. Memories are recovered, secrets are revealed, old debts are settled, and nothing is what it seems. Your character sheet starts as blank as your memories, but your character gains skills by having flashbacks to their previous life, so as the game progesses their backstory does too – creating a twisted web between the characters, as they piece their past together and work out how that fits with what’s happening to them. The mechanics are based on the casino game Blackjack played with Tarot cards, creating high-stakes narrative showdowns, and spinning elements of the game’s story from the cards that come up in play. ‘Alas Vegas’ lasts four sessions, structured like a high-budget HBO miniseries, leading to a revelatory final climax that’s a fitting end of the campaign. It’s Franz Kafka’s Fear and Loathing. It’s The Hangover meets The Prisoner. It’s Ocean’s Eleven directed by David Lynch. It’s like nothing you’ve played before. REMEMBERING COSMIC MAN, in which you play two characters: one of a gang of superheroes whose leader has just been found dead, and one of the police investigating the crime, by Laurent Devernay and Jerome Larre. Plus all the Fugue mechanics, of course. John Kovalic contributes an exclusive in-game comic strip! And Sean Smith describes how to… but you have to let us keep a few secrets.